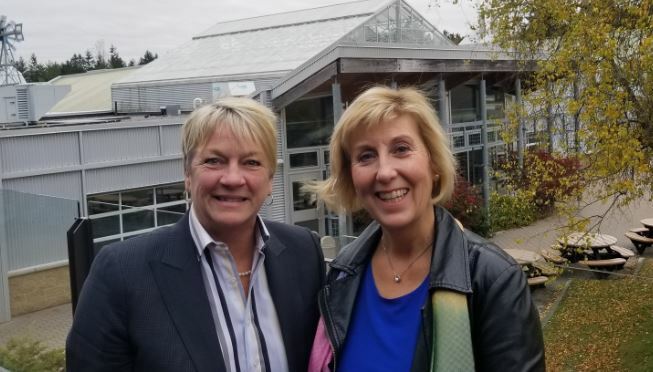 (LINDSAY, Oct. 26, 2018) – Haliburton-Kawartha Lakes-Brock MPP Laurie Scott and Fleming College president Maureen Adamson met at Fleming’s Frost Campus in Lindsay to discuss the measures announced by the government earlier this week to improve skills training in the province. The government announced that it is terminating the Ontario College of Trades – an important step to help close the skills gap that is hurting businesses and industries throughout the province. The modernization of skills training is long overdue as growing numbers of employers throughout the province are struggling to find qualified people. The Ontario Skilled Trades Alliance reported last year that up to 41 per cent of the employers it surveyed would hire more people if they had the right skills. Part of the effort to strengthen the workforce includes reforming apprenticeship training. Ontario’s colleges continue to champion measures to allow more people to enrol in apprenticeship training and to successfully complete their programs. In particular, colleges are encouraging the government to create a one-window application service to apprenticeship training by expanding the provincial application service for college students to include apprentices.